I bought a shiny new rotary cutter a year or two ago. I’m pretty sure I even bought extra replacement blades. It was during one of those mega-sales at the big box store and back when I had a bit more cash to burn. I cannot find it now. I have an old tiny one with a dull blade that sits unused in my sewing box, so I went to purchase new blades for it. But then I didn’t because they are so inexplicably and maddeningly expensive. So I continue to search for my lost one. I have several boxes marked “art supplies.” So far, it has not been in any of them. Instead I’ve found some other useful things. 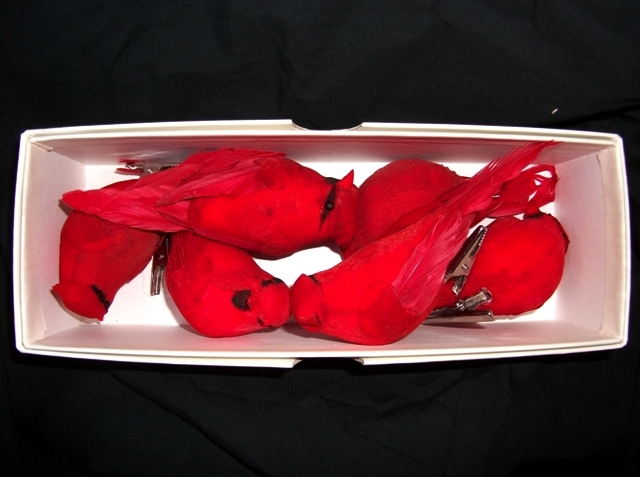 A box of faux cardinals. I have some bright red roving [red rover, red rover… ] in my stash that I got unenthusiastically in a grab bag. I think I was thinking of making cardinal-themed art yarn out of it. I don’t think it’s a great idea. I still might make it one day. Dyestuff. I just knew I bought Kool-Aid a few years ago for yarn dying purposes, but hadn’t been able to find it until now. And yay, I have greens, blues, and darker red now! 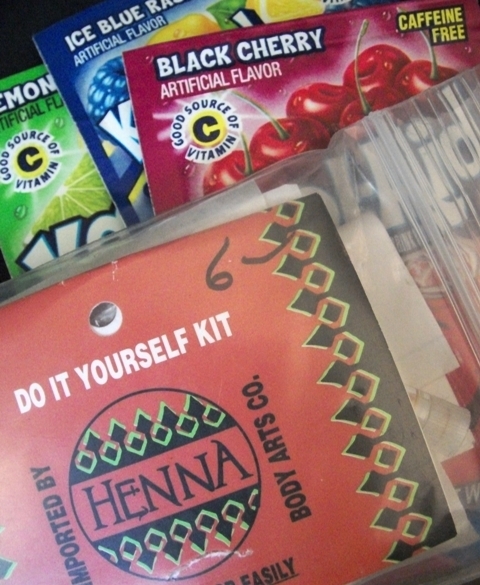 And the henna – why not try it on wool? 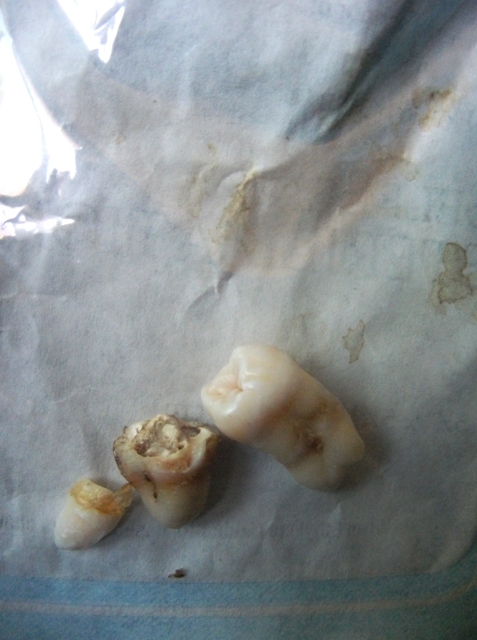 Yeah, I had a couple of wisdom teeth extracted (and one quite violently) and had to keep a souvenir. 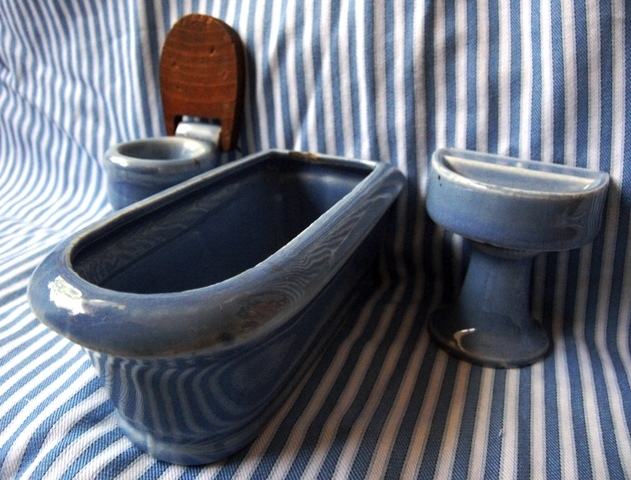 And since I don’t have a new real bathroom, I can play with this vintage/antique? dollhouse set. I forgot I found it at an antique store just a couple of years ago as well. The box should have been labeled sh*t from a couple of years ago but not including your rotary cutter.